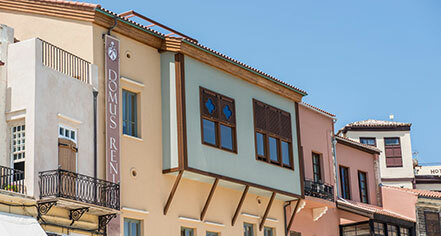 Domus Renier Boutique Hotel is a small yet impressive luxury boutique hotel in Chania, Crete. It consists of nine guestrooms and suites, all different from one another, and most offer a sea view of Chania harbor and the Egyptian Lighthouse. The accommodations are furnished with specially designed furniture and decorated with unique articles. Some rooms feature adorned ceilings, a testament to the Cretan Renaissance period of the building. Each and every one is equipped with comfort, luxury, and modern technology in mind. The hotel is located in the old port of Chania, the second largest city on the island of Crete, and also the capital of the local government region (municipality) which bears its name. Chania is on the north coast of Crete, around 60 km (37 miles) west of Rethymno and 135 km (84 miles) west of Heraklion. Often referred to as the "Venice of the East," Chania is a city that is divided into two parts: the old town, and the larger modern one. Chania old town surrounds the old harbor port, the basis of the development of the whole urban area and the modern city. The old town was once surrounded by Venetian fortifications dating back to 1538, but today only the eastern and western parts remain. Doges, politicians, diplomats, army commanders and countesses have lived and died, loved and hated, pulled political strings and ruled from the rooms of this very townhouse. Cancellation Policy: In case of cancellation: 21 days in advance 50% of the total cost is charged. In case of cancellation 15 days or less, in case of non-show or early departure, 100% of the total stay is charged. 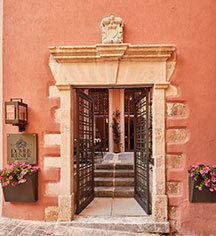 Domus Renier Boutique Hotel is a small yet impressive luxury boutique hotel in Chania, Crete. It consists of nine guestrooms and suites, all different from one another, and most offer a sea view of Chania harbor and the Egyptian Lighthouse. The accommodations are furnished with specially designed furniture and decorated with unique articles. Learn more about the History of Domus Renier Boutique Hotel .